Creme Neutralizing Crayons quickly banish red, blue, and dark discoloration, accentuate highlights, or correct facial features. Ben Nye's creamy, richly pigmented formula blends easily. Great for quick touch-ups and effective at covering freckles and age spots on hands for close-ups. 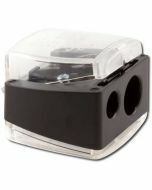 Sharpen with Ben Nye's Dual Hole Sharpener. 0.52" x 0.52" x 4.6"